In contemporary art exhibitions, film installation and video art play as big a role as any other medium, which is echoed in the exciting array of video work being shown for A Needle Walks into a Haystack. To celebrate these artists, we take a look at a selection of the films in this year’s Biennial Exhibition, and uncover where you can see more film around the city this summer. 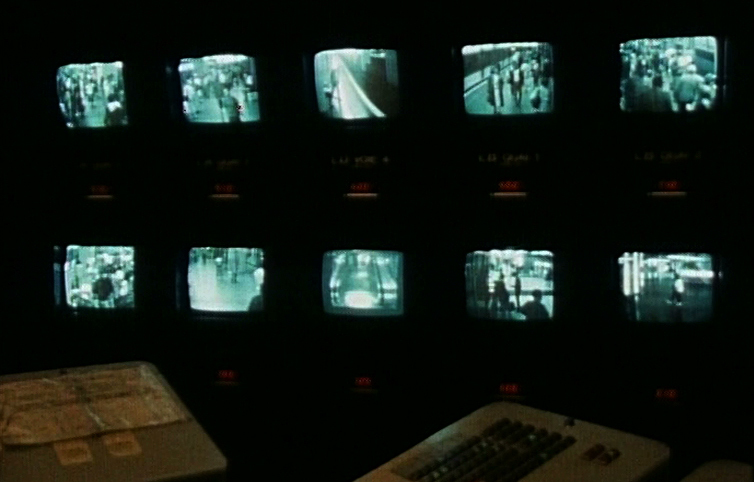 Belgian television director Jef Cornelis made over 200 films during his career, which spanned over 30 years and captured many of the changes and innovations taking place in the art world during that time. For Liverpool Biennial 2014, a special exhibition featuring a selection of these films takes place in St. Andrews Gardens, a 1930s art deco-inspired Grade II Listed building once known as the ‘Bullring’ which started life as council housing and has been refurbished more recently for student accommodation. In this domestic setting, the exhibition is first of its kind in the UK and includes a huge variety of films, from interviews with Richard Hamilton and Andy Warhol to coverage of art festivals such as Documenta. Cornelis explored how art, architecture and culture are represented and talked about – all the while asking questions about the medium of television itself. Often broadcast during prime slots in the evening, the content and style of his television programmes interrupted the comfortable routine of home viewing. In a selection curated by Koen Brams, these works have been newly translated into English, making this a must-see retrospective of his work. Read more about Cornelis’ work in the Tate Papers. At FACT, Sharon Lockhart presents Podwórka, a film made in 2009 which explores how a group of children in the Polish city of Lodz use the dilapidated courtyards (podwórka) where they live as an imaginative play-space. Across six courtyards, we see parking lots, storage units, and metal armatures become jungle gyms, sandboxes, and football fields demonstrating the resourcefulness of childhood. On Friday 17 October, FACT will host the world premiere of Lockhart’s newest film, for which she returned to Poland to work with a young girl named Milena whom she met whilst filming Podwórka. Milena also appears in a series of photographs taken by the artist on display in the foyer at FACT. Sharon Lockhart, Podwórka, 2009. © Sharon Lockhart, 2008 Courtesy the artist, neugerriemschneider, Berlin, Gladstone Gallery, New York and Brussels, and Blum & Poe, Los Angeles. To accompany the exhibition, Lockhart has also curated a film programme showing fortnightly on Wednesday evenings at FACT. The films explore themes of childhood and have so far included Richard Linklater’s Boyhood, shot over a 12 year period with the same cast, and Haifaa al-Mansour’s Wadjda, the first feature-length film made by a female Saudi director. 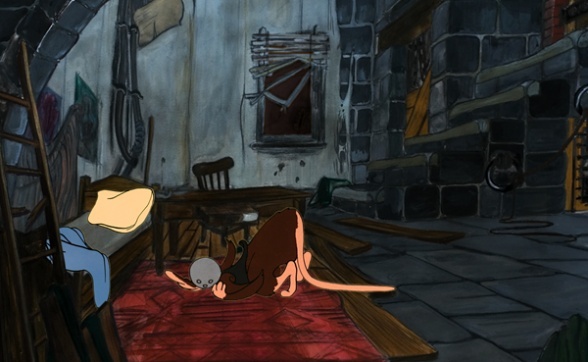 “A shakily-drawn cartoon rat enters a room and gets into a sad-looking bed, sleeps and when morning comes, rises and leaves.” Writing for The Double Negative, Richard Whitby refers to one of Peter Wächtler‘s untitled films as his favourite piece of work in the whole Biennial Exhibition. A series of three shorts, each narrated in the artists accented melancholy monologue finds a dark humour and platform for the exploration of contemporary social issues in some of the most unexpected of places. See all three works and a selection of watercolours and sculptures by the artist at The Old Blind School. As part of the group exhibition at The Old Blind School, artists Louise Hervé & Chloé Maillet present The Waterway (2014), A Treatise on Baths (2013) and A Recess and a Reconstruction(2011). Weaving together themes inspired by science-fiction and historical fact, the duo build narratives exploring our present and possible dystopian future. In one film, Hervé & Mailletcombine marine archaeology, Thalassotherapy (the medical use of seawater as a form of therapy), forgotten civilisations, immortality and post-humanity in a nightmarish vision of a world inhabited by amphibious beings. 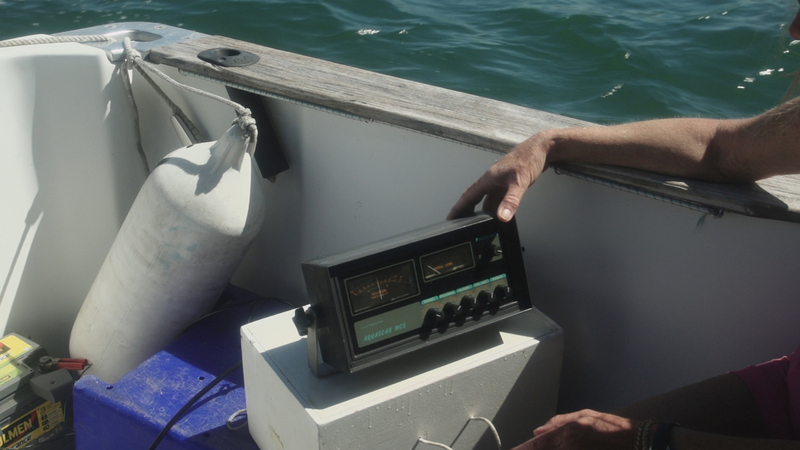 Still from The Waterway, 2014. HD video. Photo Credit: red shoes│SOME SHOES /I. I. I. I. courtesy Marcelle Alix Gallery with support from Pole image Haute-Normandie, Région Pays de Loire, La Passerelle. A special film screening of Leslie Buchbinder’s film Hairy Who & The Chicago Imagists with a Q&A afterwards takes place at FACT. Featuring work from Christina Ramberg, part of the group exhibition at The Old Blind School, Hairy Who… is a lavishly-illustrated romp through Chicago Imagist art: the Second City scene that challenged Pop Art’s status quo in the 1960s, then faded from view. Forty years later, its funk and grit inspires artists from Jeff Koons to Chris Ware, making the Imagists the most famous artists you never knew. 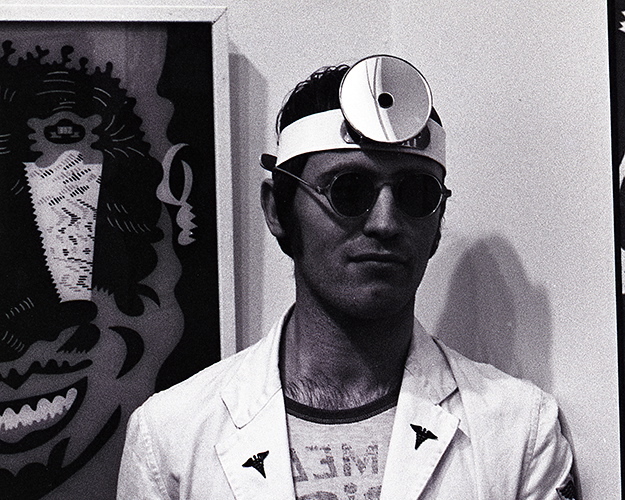 Karl Wirsum at the Hyde Park Art Center, 1967. Photo by: William Arsenault. Courtesy of Pentimenti Productions. Presented at FACT, this special commission for Liverpool Biennial 2014 invites you to an evening of new moving image works by Sonia Boyce, Petra Bauer, Keren Cytter, Agnieszka Polska, and Marinella Senatore, that respond broadly to the regulations and social orders that govern our lives – and in turn, the way that we attempt to break or navigate these rules. A Q&A session with artist Sonia Boyce precedes the screening of the films. This is a selection of some of the films being shown throughout the festival, and there is yet more to discover. At Tate Liverpool, within Claude Parent’s La colline de l’art you will find Trisha Brown’s Water Motor, whilst upstairs in the display of works from the Tate Collection is Keren Cytter’s The Coat. Meanwhile, at The Old Blind School, there are further film works by Chris Evans (Company, second floor) and Uri Aran (The Donut Gang, first floor), as well as a ‘floating cinema’ on the top floor, where you will find Judith Hopf and Henrik Olesen’s Türen/Doors. In addition to this, discover Michael Nyman’s film installation Aztecs in Liverpool at the Walker Art Gallery, or venture into venues such as The Royal Standard and 24 Kitchen Street for an experience of what else the city has to offer in terms of film this summer. This entry was posted in Art & Events, Film and tagged #Biennial2014, a needle walks into a haystack, Agnieszka Polska, art, bullring, fact, film, Hairy Who & The Chicago Imagists, jef cornelis, Keren Cytter, leisure discipline and punishment, leslie buchbinder, liverpool biennial, Louise Hervé & Chloé Maillet, Marinella Senatore, Peter Wächter, Petra Bauer, sharon lockhart, Sonia Boyce, st andrews gardens, the old blind school. Bookmark the permalink.